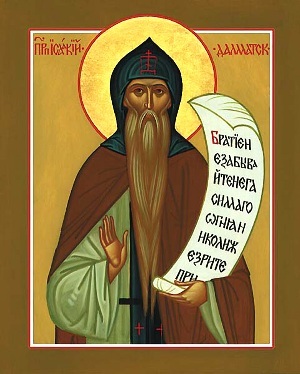 Our venerable father Isaac the Confessor (also known as Isaac of Dalmatia) is commemorated by the Orthodox Church on March 22, May 30, and August 3. He is known for his struggle against the Arian heresy during the reigns of the Arian emperor Valens and the Orthodox emperor Theodosius. Although Elder Isaac is believed to have been a Greek-speaking Syrian, this is not certain. What is known is that he was a Greek-speaking eastern hermit who lived in the wilderness. His hagiographies begin with his appearance before the emperor Valens in the year A.D. 378. Valens had aided the Arians of Constantinople in their persecutions of the Orthodox, which included expelling Orthodox bishops and closing certain churches while giving others to the Arians. At the time of Isaac's visit, Valens and his army were on their way to fight an army of Goths which had marched down from the Danube toward Thrace. Receiving an audience with the emperor, Isaac said to him, "O Emperor, open the churches of the Orthodox, and God will bless your path." Ignoring Isaac's warning, Valens continued his journey to battle. The next day, Isaac once again ran out to warn the emperor. Valens, moved by Isaac's boldness and sincerity, was almost persuaded to do as he asked. However, one of his advisers (an Arian) convinced him not to do as Isaac requested. On the third day, Isaac's manner became more confrontational. Tradition says that he ran up to the emperor's horse and grabbed it by the reins. Once again, he begged Valens to give the Church its freedom, this time also adding a warning of divine retribution if Valens did not fulfill his request. Valens, offended at Isaac's audacity, had him thrown into a deep pit, filled with mud and thorns. This would not hinder the saint of God, however. On the fourth day, Isaac again appeared before the emperor. This time, Isaac said, "You wanted to destroy me, but three angels pulled me from the mire. Hear me, open up the churches for the Orthodox and you shall defeat the enemy. If, however, you do not heed me, then you will not return. You will be captured and burned alive." Isaac added, "Learn from experience that it is hard to kick against the goads. You will not return, and this expedition will be destroyed." Valens, incredulous and offended, ordered his attendants, Saturninus and Victor, to imprison the monk until his return. On August 9, 378, Valens' army engaged the Goths in what would later become known as the Battle of Adrianople. The Goths utterly defeated the Greek army, and Valens fled into the countryside with his generals. Valens and his generals took refuge in a barn filled with straw, which the Goths surrounded and set ablaze, the emperor perishing exactly as Isaac had foretold. Some of the soldiers that survived the battle came to Isaac's cell and said to him, "Prepare to make your defense before the emperor, who is coming to fulfill what he spoke against you." Isaac calmly answered, "It has already been seven days since I smelled the stench of his bones, which were burned in the fire." The Orthodox emperor Theodosius succeeded Valens. Having heard of Isaac's prophecy and its fulfillment, Theodosius released Isaac from prison and summoned him to appear before him. The emperor prostrated himself before the elderly monk, asking his forgiveness. Theodosius did as Isaac had petitioned Valens, also exiling the Arians from the city for their persecution of the Orthodox. Having restored peace to the Church in Constantinople, Isaac wanted to return to his life in the wilderness. However, he was persuaded to remain in Constantinople. A wealthy aristocrat named Saturninus built a monastery for Isaac within the city, where he lived in ascetic struggle, working many miracles. Isaac is also known for his zealous witness to the Orthodox faith at the Second Ecumenical Council, convened in Constantinople in A.D. 381. Isaac is believed by some authorities to have died in A.D. 383, although others place his death around A.D. 396. However, neither of these might be accurate; the life of John Chrysostom includes mention of St. Isaac living into the fifth century. At least one account says that John, as bishop of Constantinople, disapproved of monks who roamed the streets visiting friends in their private houses, out of his concern that the monastic reputation would be marred. Those who did not approve of Chrysostom's new rules brought their complaints to Isaac, who in turn is said to have voiced them at the Synod of the Oak in A.D. 403. 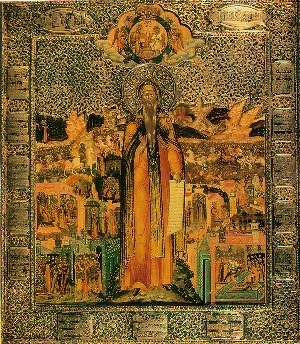 At the end of his life, he entrusted the leadership of his monastery to his closest disciple, Dalmatus (later himself glorified by the Church). Isaac's monastery was later to be named "Dalmatian" after this disciple, hence Isaac's later appellation, "of Dalmatia." Therefore your spirit, venerable Isaac, rejoices with the angels. you prophetically foretold to him the captivity of the Church and of his own wretched death. Therefore, venerable Isaac, ceaselessly pray for us who honor you. Prologue from Ohrid, May 30. By Nikolai Velimirovich. This page was last edited on August 9, 2017, at 02:42. This page has been accessed 19,706 times.